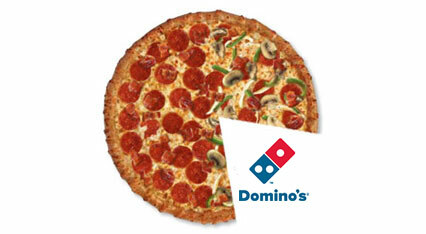 Enjoy the nations favourite Pizzas with Dominos Pizza. Some Dominos outlets around the UK offer an Armed Forces discount with up to 50% off (see instructions below)! Call your local Dominos Pizza and ask if they have the 50% off Armed Forces discounts before making your order. If they decline this offer, please let Dominos HQ know by contacting them on their website, they may be able to get your local Dominos to enable the Armed Forces Discount for your next order. If you´re in luck, show your service ID to the Pizza delivery man upon arrival or at collection. Eat Pizza, dip crusts, enjoy! Click ´Get Code´ above to get the latest discount code. If there are no discount codes currently on you can click the ´Deals´ tab on the Dominos website to see the latest discounts in your area. Not valid with any other offer or deal. Valid at participating stores in the UK. Ask in store for details. To see our general terms and conditions, see our page ´boring legal stuff´ at dominos.co.uk. Get instant access to all discounts - for free! PROUDLY SERVING: ALL SERVICE MEN AND WOMEN, EX-FORCES AND MILITARY FAMILIES. © TroopScout Ltd all rights reserved. Registered in England and Wales Company No. 07989761. Get instant access to exclusive British military discounts from top brands - for free! Still no link? Check your spam folder before contacting us. TroopScout proudly serves: All serving British Armed Forces members, Ex-Forces, MOD Civil Servants, Reservists, Cadets, NATO Personnel, British Legion Members, spouses and immediate family members of all the above. Please note that we do not store your military information. What’s your title of unit? What’s is the service/employee number of your serving family member? I confirm that the above details are accurate of myself. I acknowledge that providing incorrect information breaches TroopScouts terms and conditions. You are now verified and have full access to all deals. Thank you so much for your service and sacrifice. from top brands - for free! By signing up you accept our Terms.